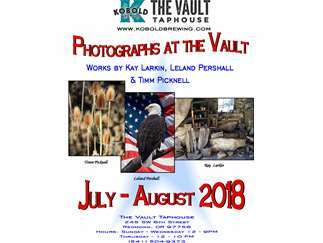 Leland Pershall a retired teacher who has loved photography since his college years. Basically self- taught, Leland strives to capture "a moment in time" with each photograph. Many of his works depict singular instances that can be experienced once and never again in exactly in the same way. The Vault is a family-friendly Taphouse in downtown Redmond. Visit our Taphouse and watch your favorite sports team on TV or play cards with friends. Sit on the outdoor patio and check out Redmond’s downtown scene. Enjoy street tacos from Westside Taco Co. Kobold Brewing's line up of beers will be on tap or you can sip on another one of your favorite ales, ciders or wine. For additional information about the exhibiting photographers or for additional images, contact Shandel Gamer at: artinfo@bendbroadband.com. 245 SW 6th Street in Redmond.